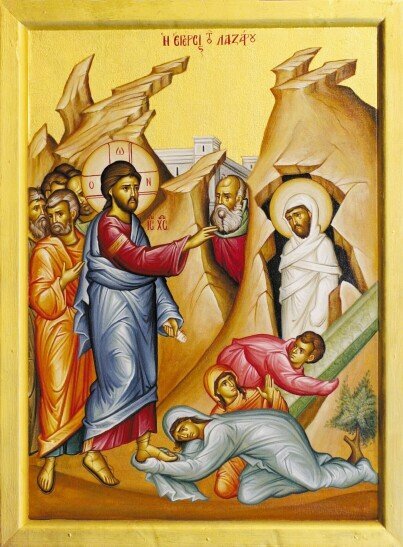 Yesterday’s gospel reading of the good Samaritan (Luke 10:25 – 37) witnesses what is needed to gain eternal life: the schema is plain – the vertical arm extends from God to man and from man to God and the horizontal arm extends to embrace the entire Eucumene. There you have it – salvation in an icon… And the icon? Why, the cross itself. The difficulty of course is principally with the horizontal arm of the cross – just who is my neighbour? The answer given by Christ is the one that shows mercy on his fellow man. Now here’s the thing: the neighbour that Christ uses to illustrate this moral principle is the figure of the Samaritan. Why use a Samaritan when a Gentile or an idolater – someone alien to the Jewish faith – could be substituted? We know from John’s gospel of the Samaritan woman that the Samaritans viewed themselves as the children of Jacob. Jacob, of course, is the Patriarch of the 12 tribes of Israel and the mountainous area of Samaria was divided between the brothers Ephraim and Manasseh. Yet, we know from the new Testament that Samaritans, who consider themselves to be righteous Jews, were indeed foreigners, unclean and to be avoided by Judeans. The reality is that we all give lip service to helping neighbour. But when it actually comes to rolling up our sleeves and doing something about it then, do we not like the Levites, cross on the other side of the road to avoid the problem of having to deal with and an situation which is unpleasant or inconvenient to ourselves? In our daily lives it is inevitable that we have conflict with those around us. Truth tell, we are we distressed by the stranger. We say that we should help the stranger (and so we should!) But, what about all those “strangers” that we avoid – be they family, relations or acquaintances – what do we do about them to show to Christ that we are merciful to them? That is something for all of us to think about. The programme for this week is as follows: Tomorrow, Tuesday, the feast day of St John Chrysostom (being the fifth anniversary of my investiture at St Nektarios) matins from 7:30 AM; 6:45 PM adult education continues where we seek to gain some insight into the intersect between God’s will and man’s will; Wednesday, the apostle Philip, matins from 7:30 AM; Friday, the evangelist Matthew, matins from 7:30 AM; Saturday divine liturgy in English 9 AM to 10:15 AM; Saturday afternoon from 3 PM children’s Bible class. The festivities of our church are at an end and now comes the time to acknowledge in deep gratitude those who help make it the great success that it was. To those who tidied and cleaned our church to present it to the faithful of Perth– Thank You; To all the clergy that came to pay respects to our Saint by co-liturgising together – Thank You; to all those who spent their time baking and preparing the wonderful goods for our cake stall – Thank You; to those who came and supported our cake stall– Thank You; to all the faithful in Perth who attended the church services and paid honour to our Saint– Thank You; for our generous patrons and supporters who regularly assist in the material needs of our church– Thank You; to those who helped with our hugely successful luncheon– Thank You; to our general, Katerina, who finds time to assist in all manner of ways in the church and especially great and grateful Thank You. Yesterday’s activities are ended and we now look forward to what is ahead. Firstly, the Christmas fast commences this Thursday. However, you are allowed to consume fish (save for Wednesdays and Fridays) up until 18 December. Thereafter it is a strict fast. We have put out the 2019 flower roster and morning tea roster. Please put your name down and assist our church. The size of our food store and the demands upon our food store continue to grow. We need staples such as spaghetti and other pasta shapes, flour, sugar, tinned meats (preferably beef based), tinned fish,oil,long life milk,breakfast cereals, tinned tomatoes, vegetables and pulses, foods of long shelf life as well. If you wish to help financially the account details that our store operates from are: BSB 082057 account 616004624. From Psalm 113: “blessed be the name of the Lord from this time forth and for evermore! From the rising of the sun to its setting the name of the Lord is to be praised.” (v2-3). In all things, let us show gratitude.